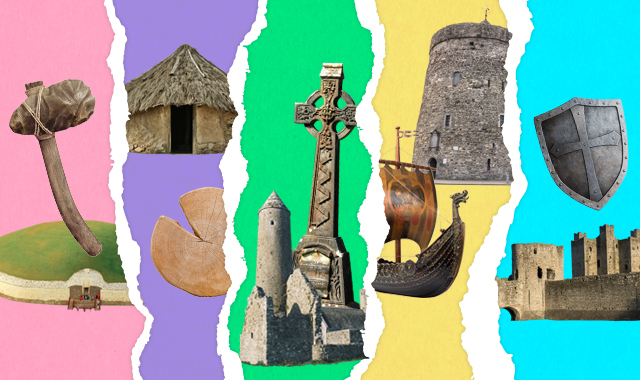 Five traditional musical instruments that have been blown, strummed, picked, plucked and thumped in Ireland for centuries. Pronounced “bow-rawn,” this is known as the heartbeat of trad music for good reason. This large drum is covered with stretched animal skin and struck with a stick (traditionally made from double-ended knucklebone) to provide our music with a pulsating beat that turns listeners into dancers with ease. Some speculate that the instrument served a double purpose as a husk sifter and grain tray. We prefer it as a drum. For a taster of what the bodhrán has to offer, re-watch Riverdance for the thousandth time. These ancient pipes have been mesmerising listeners with their haunting tones since the 5th Century. A popular instrument, the uilleann pipes (meaning “pipes of the elbow” because of their pump-operated bellows) take years to master. It was two County Louth brothers, William and Charles Taylor, who developed our most modern version after emigrating with the instrument from post-Famine Ireland to the United States. Today, though, Belfast-man John McSherry is our proudest piper and a true master. To imagine how the Ulster-Scot-influenced pipes sound, think Scottish bagpipes but better! You know an instrument has reached iconic status when it has appeared on a national flag, Euro coins and gets reimagined as a Dublin bridge. The Celtic harp is that very instrument. Variations of the triangular, gut-stringed-instrument have been plucked in Ireland since as long ago as the 10th Century, when nomadic harpists would travel around Ireland performing songs for food or a warm bed. In 1792, the Belfast Harp Festival saw the best players competing for prizes. And today, the ornate and ancient Brian Boru harp can be viewed in Trinity College in Dublin. Looks can be deceiving. Take the Irish fiddle, for example. This essential trad instrument looks identical to the violin, but its unique playing style and sound set the two apart. In trad music, the high-pitched and expressive fiddle is often heard above all other instruments, and can be euphoric and heart-breaking in equal measure. Counties Sligo and Donegal have rich fiddling traditions, though recent artists like Daithí from County Clare have been redefining the sound of this sweet instrument. Adapted from a Greek instrument and brought to Ireland in the 1960s, the Irish bouzouki is the latest addition to our traditional music arsenal. Looking not unlike a giant mandolin, the instrument was popularized by Irish folk legend Dónal Lunny from Tullamore, County Offaly, who uses one in groups Planxty and LAPD. With such a rich and bright sound its no surprise we stole the idea and made it our own. Bouzoukis are now regulars at many a traditional music session.